Some Scotch distilleries seem to live more on the peripheries of whisky history than on the center of the stage. There are those that were not designed by the leading architect of the day, that spent as much time mothballed as they did open for business, and that bounced from owner to owner over the years, never quite making it into the stables of one of the major beverage companies. Many of these have been shut down (such as Imperial) but some survive (such as Balmenach), and some even manage to make a bigger name for themselves in the modern era (such as BenRiach). On the other hand, there are those distilleries whose histories are well-known and well-tied-into the popular story of Scotch (such as Glenfiddich, Laphroaig, Glen Grant, and Macallan). These distilleries often have had the most flamboyant owners, or been part of the biggest mergers, and today, tend to be the world’s best sellers. Then there’s distilleries like relatively un-heard-of Craigellachie. Founded in 1891 by some big names in Scotch whisky, designed by the most renowned distillery architect of the day, Charles Doig, and eventually being a part of the biggest merger’s in Scotch’s history, Craigellachie has managed to be center stage and back in the shadows at the same time. The distillery did not actually begin producing spirit until 1898. It was built by a partnership led by Peter Mackie, owner at the time of Lagavulin and the man behind the famous White Horse blend, and Alexander Edward, owner of Benrinnes and later, Oban. Mackie bought out the other partners in 1916, forming Mackie & Co. Distillers Ltd. Peter Mackie died in 1924, and the company name was changed again to White Horse Distillers. In 1927, White Horse was bought out by Distillers Company Limited (DCL) and Craigellachie just kept chugging along in the service of DCL’s blended whiskies. Not much happened to Craigellachie for the next 70 years…well, ok, pretty much the entire distillery was rebuilt and modernized in 1964, but other than that, not much. Then in 1997, Guinness, who had purchased DCL in 1986, merged with Grand Metropolitan to form Diageo. The large-scale, somewhat controversial merger forced Diageo to sell off the Dewar’s brand and its four key distilleries to satisfy international competition laws. Little ol’ Craigellachie was one of those four distilleries, a small piece of the pie, integral to the popular Dewar’s blend, but fairly invisible on its own. 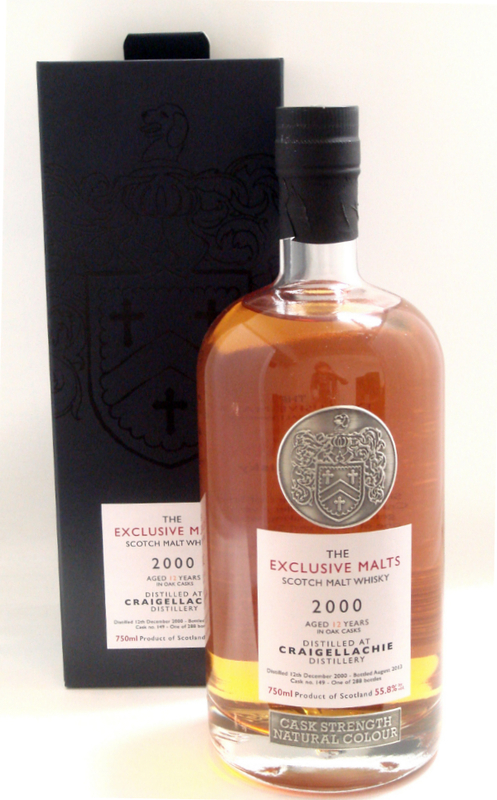 Over the years, there’s more or less just been one official distillery bottling and occasional independent bottlings such as this one from The Creative Whisky Company’s Exclusive Malts range. It may interest some to learn that Craigellachie is somewhat unusual amongst its Speyside brethren because of its use of lightly peated malt. The Nose: Very inviting and positively dripping with honey. Thick orange blossom honey and waxy honeycomb mingle with fruit notes of cherry juice and tangerines. Sawn oak and even a small hint of cedar sit well in the background with dusty cinnamon, vanilla extract, and the faintest breath of peat smoke. With water, some of that thick honey is lost as additional, stronger spice notes come out – dried orange peel and clove. While water doesn’t add much more smoke, it adds a bit more subtly tarry peat to the mix. The Palate: Big, oily mouthfeel that’s both spicy and sweet to begin with. Much more citrus here; navel orange and Meyer lemon but still a touch of that honey from the nose. Much more wood is evident on the palate as well, more oak chips, greenish clove, vanilla bean, white pepper, and a surprising little touch of mint. While it’s still subtle, there’s a stronger whiff of woodsmoke on the palate. Like the nose, adding a bit of water, tones down some of the sweetness while exposing more edgy wood and spice. The Finish: Longish with slightly under-ripe citrus, oak, clove, pepper, and that very pleasing light breath of what’s now dry wood smoke. Thoughts: Very enjoyable stuff from a distillery that’s wholly new to me. At first blush, this seems a relatively simple malt, but there’s a subtle complexity to the woodier notes, and the faint touch of peat that gives this one a surprising amount of character. Adding a little water toned down the sweeter notes, playing up the wood and spice more. On the nose, that worked, on the palate it made things seem a little younger than they were. Still, throughout, I found this engaging and quietly interesting in a way that made me wish I had more in my glass when it was gone. Recommended.